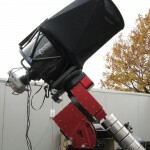 The Virtual Telescope Project offers two very powerful, state-of-the-art scopes, located in Ceccano (Italy) in a site offering an amazing seeing (mean value: 1.8″). The site is also acknowledged by the Minor Planet Center with the observatory code 470. Discover our telescopes below and imagine what they can do for you! A Planewave 17″-f/6.8 (432/2939 mm) Corrected Dall-Kirkham Astrograph, carbon fiber OTA, hosted on a Paramount ME robotic mount. 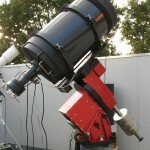 A Celestron 14″-f/8.4 (356/3000 mm) Schmidt-Cassegrain OTA with StarBright XLT coatings, hosted on a Paramount ME robotic mount.